And, BONUS, we help our clients with this everyday, so we know exactly what you need to do to get from point A to point B! Packing Tips //Wrap items individually, placing the heaviest items on the bottom and lightest items on the top. Pack similar items and sets in the same box.Label each box as you go with a description and the room it belongs to. Pack books in small boxes because they get heavy. Clean or wipe off everything as you pack them so you don’t bring your old dirt to your new home. Disconnect appliances from power and water supply just before final lock-up. Dispose properly of expired food, liquids, and medicines as you pack. 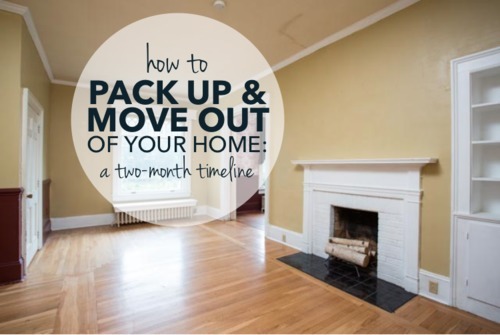 After your move, if you’ve used this two-month timeline for packing up and moving out of your home, let us know! We’d love to hear all about how it helped you through the process.